Hillary Clinton-CNN interview: A heavily edited transcript of the first national television interview of the Democratic frontrunner’s 2016 campaign. 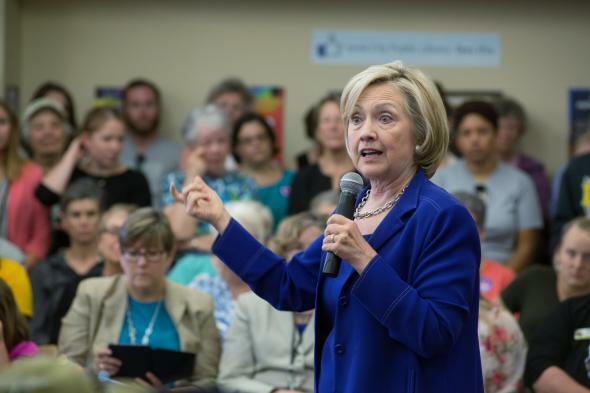 Hillary Clinton addresses supporters at an organizational rally on July 7, 2015 at the Iowa City Public Library in Iowa City, Iowa. Photo by David Greedy/Getty Images. At long last, Hillary Clinton sat down on Monday for her first national television interview since launching her 2016 presidential campaign roughly three months ago. Clinton’s sit-down in Iowa City, Iowa, with CNN’s Brianna Keilar came only days after the Democratic frontrunner’s often contentious and always awkward relationship with the media reached a new low when her campaign staff used an actual rope to keep reporters from getting close to her as she campaigned in New Hampshire. Clinton’s team has repeatedly brushed off the media’s complaints about her stonewalling but this week suggested that more access is on the way in the form of national television interviews. Clinton’s first such performance, though, makes clear that there are no guarantees that such access will come with actual answers. Keilar asked the former secretary of state a number of pressing questions on everything from whether she understood why so many Americans don’t trust her to whether she’s in favor of Bernie Sanders-style tax hikes. In response, though, Clinton opted for anodyne answers and talking points that offered little in the way of actual information. The closest she came to making news was saying she was “very disappointed” in Donald Trump (shocker!) and that she thinks whichever woman ends up on an American greenback shouldn’t have to share it with a man. All candidates dodge questions they don’t want to answer, but this was another reminder that Clinton has perfected the art of only making news when she wants to. To steal a turn of phrase from my former colleague Jack Shafer, she’s not running for president, she’s running as president. KEILAR: You’re the front-runner in this state but we’re also seeing Bernie Sanders attract a lot of attention. … Why is it, do you think, that someone who is a self-described Democratic socialist is really attracting this organic interest that your campaign seems to be struggling a little bit with? KEILAR: Senator Sanders has talked about how, if he’s president, he would raise taxes. … Would you? KEILAR: … Is raising taxes on the table? KEILAR: … We see in our recent poll that nearly six in 10 Americans say they don’t believe that you’re honest and trustworthy. Do you understand why they feel that way? KEILAR: Trusting someone to fight for them and trusting someone—these are two different things. Do you see any role that you’ve had in the sentiment that we’ve seen, where people are questioning whether you’re trustworthy? KEILAR: Would you vote for someone that you don’t trust? KEILAR: One of the issues that has eroded some trust that we’ve seen is the issue of your email practices while you were secretary of state. … Can you tell me the story of how you decided to delete 33,000 emails and how that deletion was executed? KEILAR: I know you say you were permitted. I just am trying to understand some of the thought process behind it. One former state attorney general, a Democrat, told CNN that they know of no lawyer who would advise someone, a client, facing the kind of scrutiny that you’ve been facing to wipe their server. I mean, what do you say to that? KEILAR: There has been a lot of controversy surrounding your family’s foundation, The Clinton Foundation, corporate and foreign donations that have gone to the foundation and the work that it does. Has it made you think, seeing this controversy, that it’s come about, has it made you think about if you are president, what will happen to The Clinton Foundation? Have you thought about perhaps shutting it down? CLINTON: … I have no plans to say or do anything about The Clinton Foundation other than to say how proud I am of it and that I think for the good of the world, its work should continue. KEILAR: Let’s talk now about Republicans. … Right now the front-runner is Jeb Bush. Can you believe that a quarter century after your husband was elected, there could be another Bush-Clinton race? KEILAR: Donald Trump is also creating quite a lot of commotion on the other side. … What’s your reaction to his recent comments that some Mexican immigrants are rapists and criminals? KEILAR: But what about Jeb Bush’s approach to that? It’s different, certainly, than Donald Trump’s. KEILAR: Last week an undocumented immigrant who had been deported five times killed a 32-year-old woman, Kate Steinle, in San Francisco, a sanctuary city where local law enforcement does not enforce federal immigration laws. When you last ran for president you supported sanctuary cities. In light of this terrible incident, does that change anything about your view on this? CLINTON: Well, what should be done is any city should listen to the Department of Homeland Security, which as I understand it, urged them to deport this man again after he got out of prison another time. … So I have absolutely no support for a city that ignores the strong evidence that should be acted on. However, there are [exceptions]—like if it were a first-time traffic citation, if it were something minor, a misdemeanor, that’s entirely different. This man had already been deported five times and he should have been deported at the request of the federal government. KEILAR: Just a couple quick questions before we go. What’s changed when it comes to your approach with the media? … What’s changed? Why now? KEILAR: Have you given any thought to the woman who should be on the $10 bill? CLINTON: You know, I am very torn about it. I want a woman on a bill. I don’t know why they take the $10 bill. Some people are now agitating for the $20 bill. KEILAR: Do you think it should be the $20? CLINTON: You know … I think that it might be easier to change the $20 than it is to change the $10. … And I don’t like the idea that as a compromise you would basically have two people on the same bill. … So I think a woman should have her own bill. And it may be more appropriate to look at the $20 than the $10. I don’t know. We’ll see. KEILAR: And finally, I know you’ve seen your new doppelganger on Saturday Night Live, Kate McKinnon. … Who’s the better Hillary Clinton, Kate McKinnon or Amy Poehler? KEILAR: Secretary Clinton, thank you so much for talking with us.